The fun and excitement surrounding Halloween can suddenly turn to sorrow and misfortune through one careless act. The incidence of fire, accident, and injury often increases during holidays and festive events. Each year, firefighters and paramedics witness incidents on Halloween that could have been prevented had simple safety rules been followed. Among the high-risk activities on Halloween; door-to-door trick-or-treating is one of greatest concerns to Fire/Emergency Medical Services (EMS) Department personnel. Between 4:00 PM and 10:00 PM on Halloween, there is a significant increase in falls, burn-related injuries, and pedestrian injuries. Children are four and a half times more likely to be hit by a car on Halloween than on any other night during the year. Falls are the leading cause of unintentional injuries on Halloween. Additionally, many parties and festivities are planned over the Halloween weekend which could result in an increase in adult alcohol consumption with inherent dangers. • Costumes should be made of flame resistant light-colored fabric or have reflective qualities. They should be short enough so as not to interfere with walking or become entangled in bicycle chains. Use facial makeup rather than masks so children can see easily. • Children should carry flashlights and not use candles or torches. Before leaving the home, children should discuss the proposed route, time of return, and companions. An adult should always accompany younger children. It is advisable to visit the homes of persons you know or local familiar neighborhoods, stopping at well-lit houses only. As a general rule, children should avoid entering homes or apartments and always travel with a companion. • Children should avoid busy streets, always use sidewalks, and follow all traffic rules and regulations. Motorists should avoid all unnecessary travel on Halloween evening, and when driving they should drive slowly and be alert to small children crossing streets. Many accidents occur when motorists are backing vehicles out of driveways, unaware of the presence of small children. • Halloween treats should be saved until children return home where adults can examine all items closely. Treats that are unwrapped, or show signs of having been opened, should not be eaten. Fruit should be sliced into small pieces and checked for foreign objects. Keep small pieces of candy away from infants and very small children, as they can easily become lodged in the throat and cause choking. • Persons receiving trick-or-treaters should keep a light on and pick up obstacles that could cause a child to trip and become injured. 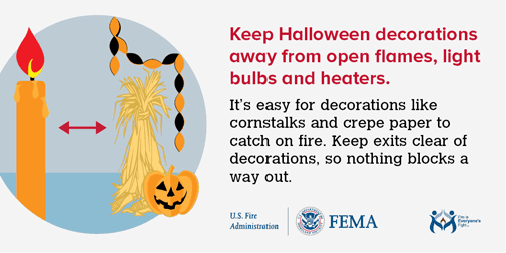 Jack-o-lanterns should be kept clear of doorsteps and landings. 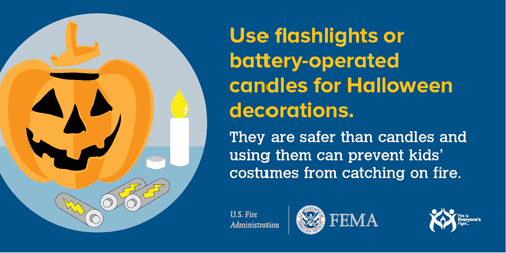 Consider the possibility of using flashlights instead of candles to light Jack-o-lanterns. Keep dogs and other pets away from doors so children will not become frightened. A recent trend in celebrating Halloween has been to celebrate as groups at parties or community events in addition to more adult Halloween parties being held. This trend has resulted in fewer door-to-door trick-or-treaters, however, creates additional vehicles on the street. With Halloween falling on Tuesday, October 31, there are numerous additional Halloween parties planned for both adults and children over the October 27, 28 and 29th weekend. • Always wear your seat belt and ensure everyone in your vehicle is buckled up as well. • If you are wearing a costume – vehicle occupants, including the driver, should not wear a mask or head dressing as this may block the view of the driver. • Be aware that there are still many trick or treaters walking and crossing streets – slow your speed and use extreme care while driving. • Use battery powered illumination instead of candles at your Halloween celebration, including inside of your carved pumpkin.